Sometimes I use ‘transitivity’ to come up with new dishes. A relationship between two objects is transitive if whenever an object A is related to an object B, and B is in turn related to an object C, then A is also related to C. Confused yet? Let me explain it with food and wine, then hopefully it will make sense more quickly. If A is good with B, and B in turn is good with C, then very often A is also good with C. There are several examples on my blog. As sauvignon blanc pairs well with goat cheese and sauvignon blanc pairs well with asparagus, goat cheese should pair well with asparagus. That is how I came up with this pasta dish. As Sauternes pairs well with blue cheese and Sauternes pairs well with foie gras, foie gras should pair well with blue cheese. And so this dessert was born. 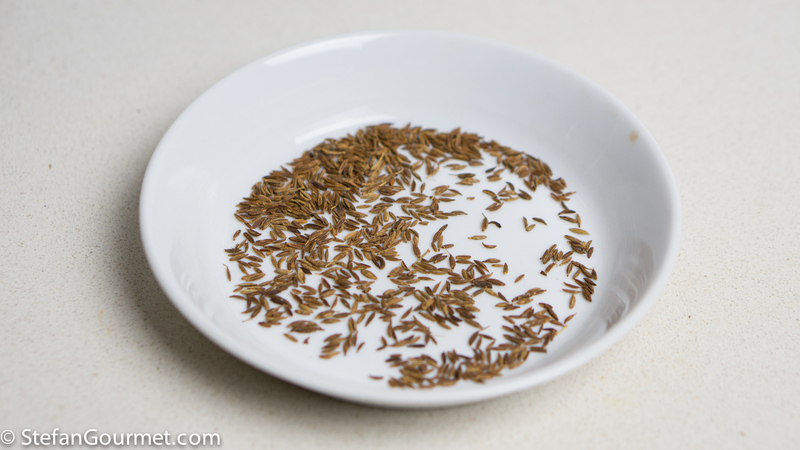 According to Niki Segnit’s Flavor Thesaurus, cumin pairs well with tuna, and cumin pairs with carrots. With the help of transitivity, tuna, carrots, and cumin should work together. 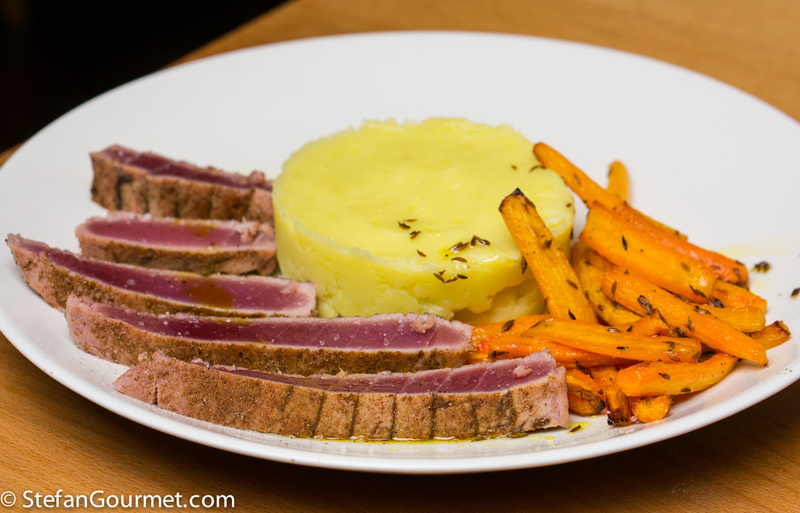 And so I created this dish of cumin-roasted carrots with cumin-crusted tuna, served with mashed potatoes. And guess what? It was unbelievably delicious! This is probably the best original combination I’ve tried this year. 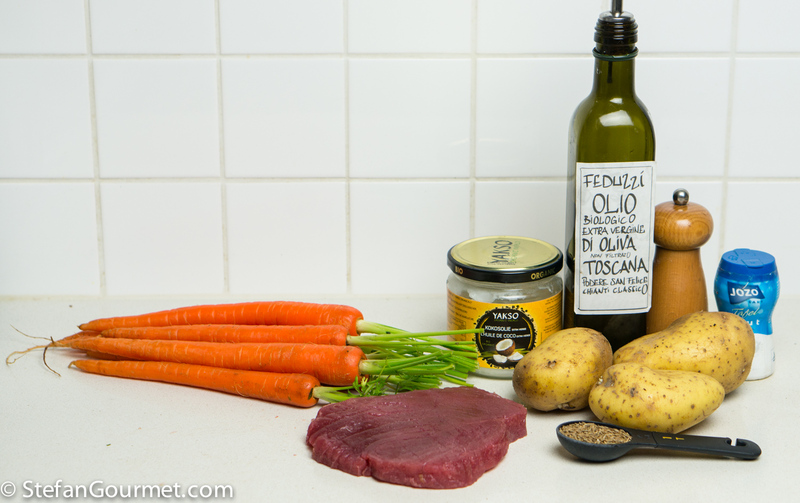 The cumin brings out the earthy sweetness of the carrots, the textures of the smooth potatoes with the tender tuna and crunchy carrots work well together, and the cumin enhances the flavor of the tuna. This dish is quite easy to make. Just make sure you don’t overcook the tuna as that would ruin it! Allow the tuna to come to room temperature. Preheat the oven to 225C/440F. 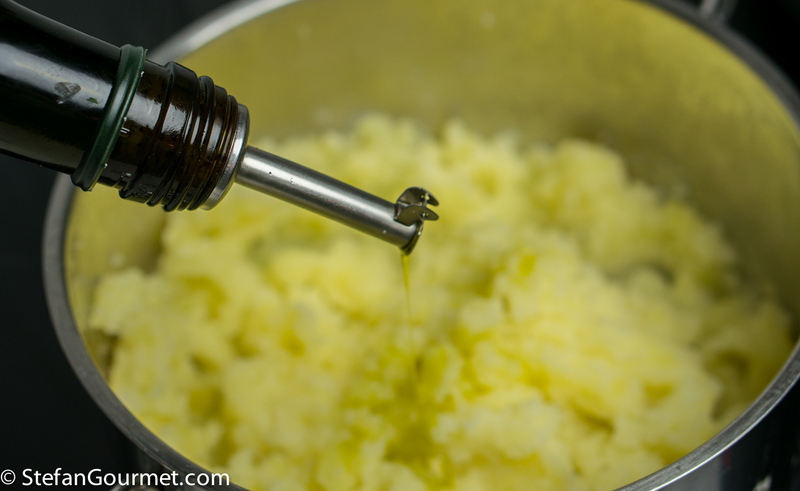 Put a tablespoon of coconut oil in an oven proof dish, and put it the oven until the oil has melted. 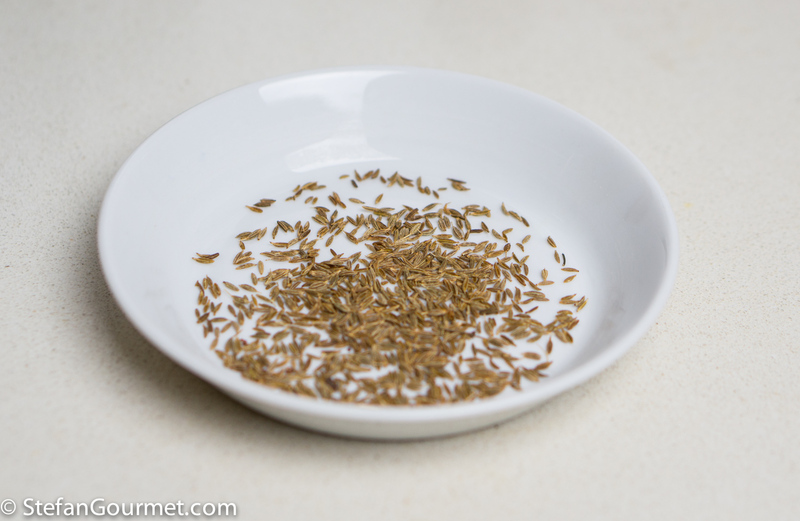 …and toast the seeds in the oven until they are browned and fragrant, about 5 minutes. 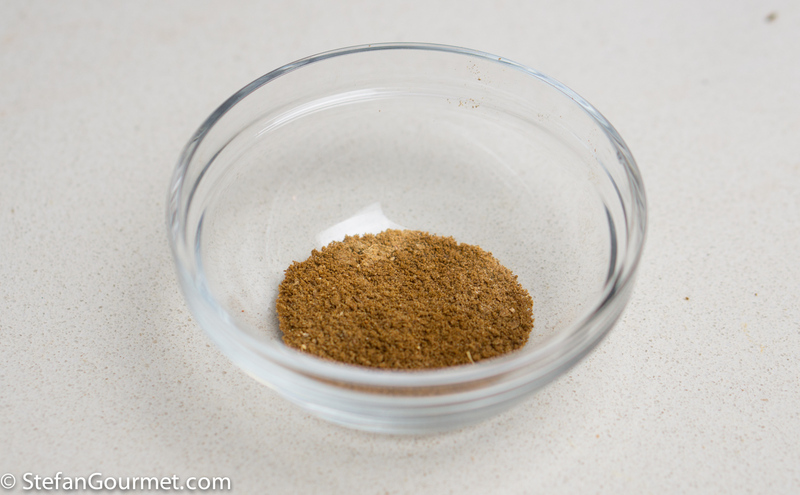 Grind the toasted cumin seeds. 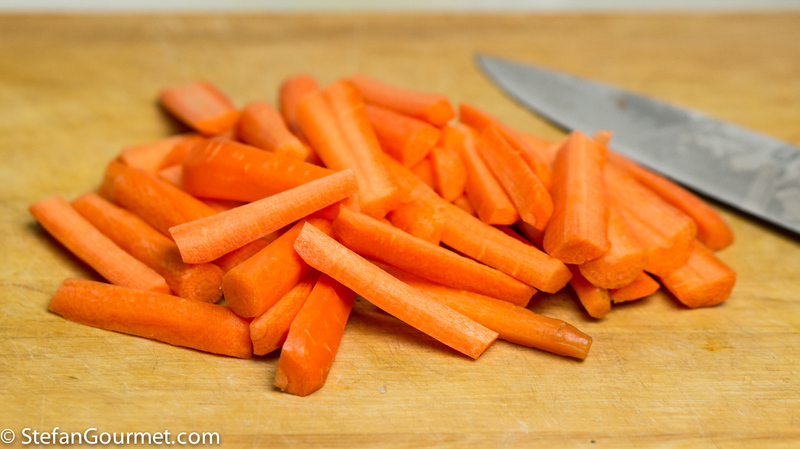 Peel the carrots, cut them into quarters lengthwise and into 10-15 cm (4-6 inch) lengths. Put the carrots in the oven dish with the coconut oil, add a teaspoon of cumin seeds, and toss to coat the carrots with the cumin seeds and coconut oil. Roast the carrots in the oven at 225C/440F until they are tender on the inside and slightly browned and crunchy on the outside, about 45 minutes. Stir the carrots every 15 minutes or so in order to roast them (and the cumin seeds) evenly. It is important to use oil with a smoke point higher than 225C/440F, such as coconut oil, to prevent the oil from burning. For this reason, extra virgin olive oil is not a good choice. Meanwhile, peel the potatoes, cut them into chunks, and boil them in salted water until they are tender, about 25 minutes. 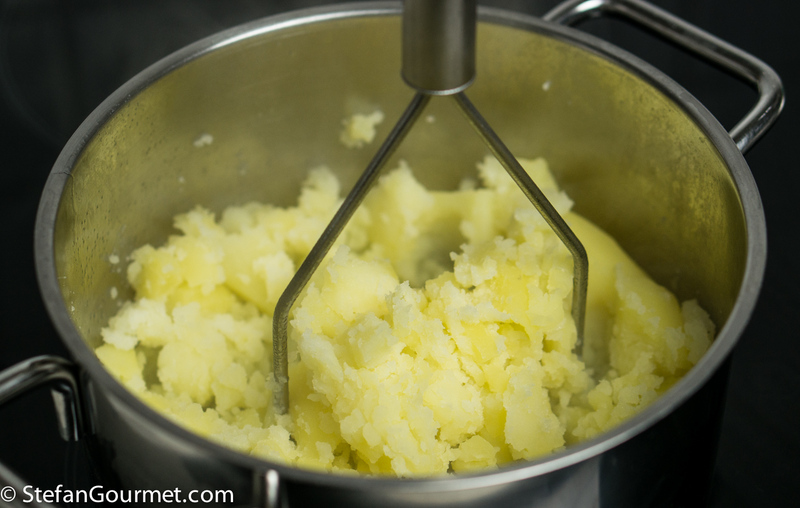 When the potatoes are tender, drain them, but leave a few tablespoons of the cooking water, and mash them. 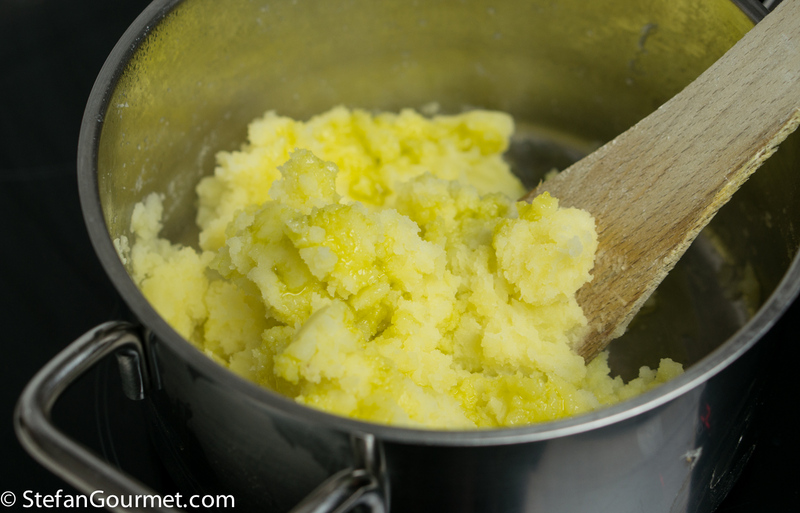 …and stir to incorporate it. 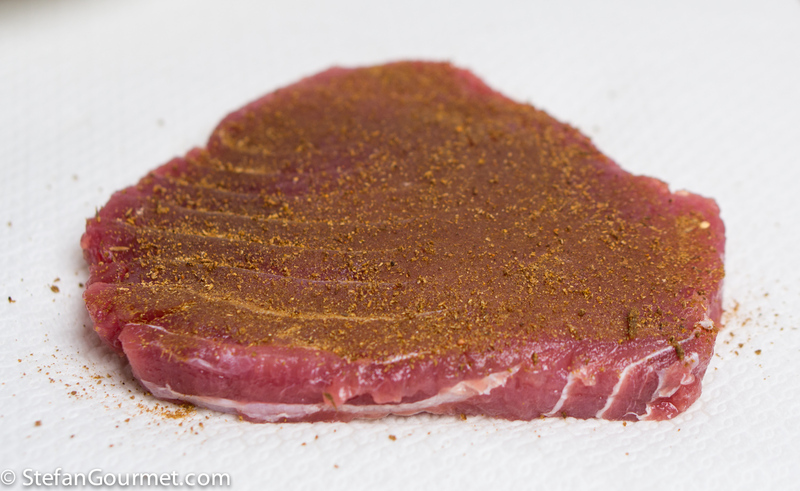 When the carrots are almost done, rub the tuna with the ground cumin seed on both sides. Preheat a frying pan to get it very hot. 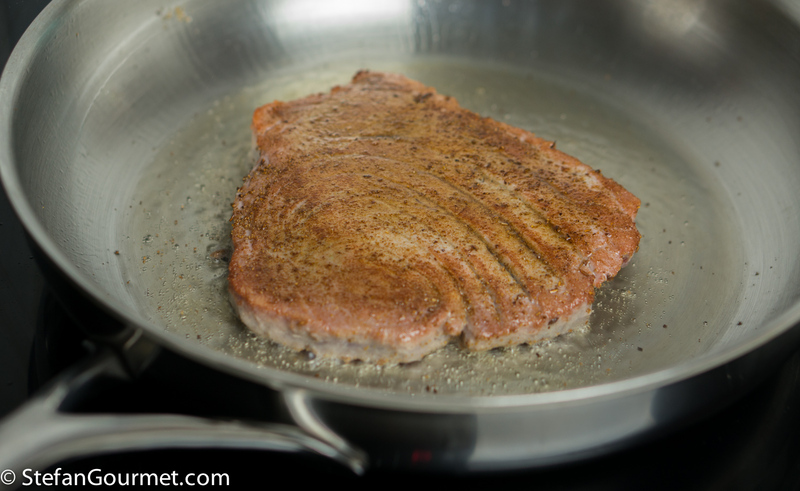 Add two of coconut oil to the hot frying pan, and then the tuna. Cook for about 30 seconds over very high heat. Carefully turn the tuna and cook for about 30 seconds on the other side. Do not overcook the tuna. 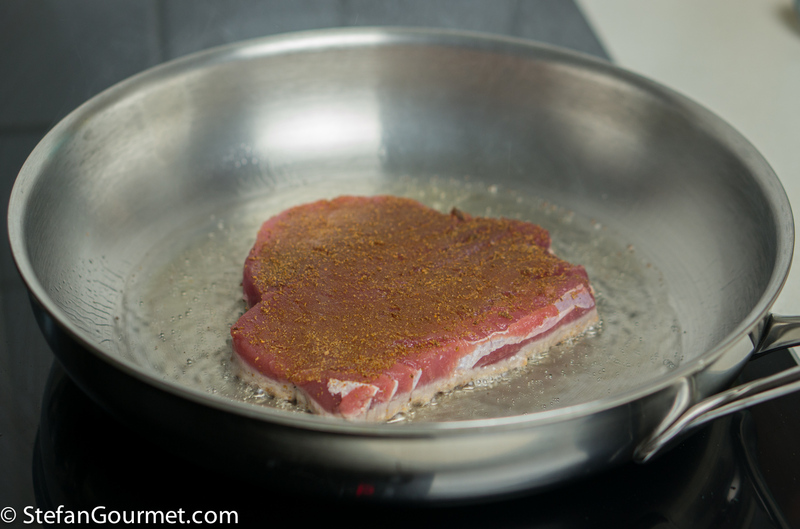 After searing, cover it with aluminum foil and allow it to rest for about 5 minutes. Slice the tuna and serve it with the mashed potatoes and carrots on preheated plates. Season the tuna and carrots with coarse sea salt and freshly ground black pepper. 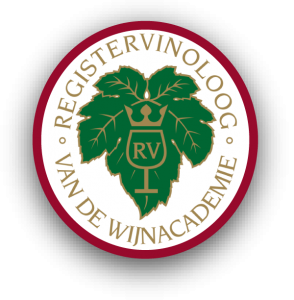 This is great with most oaked full-bodied whites. 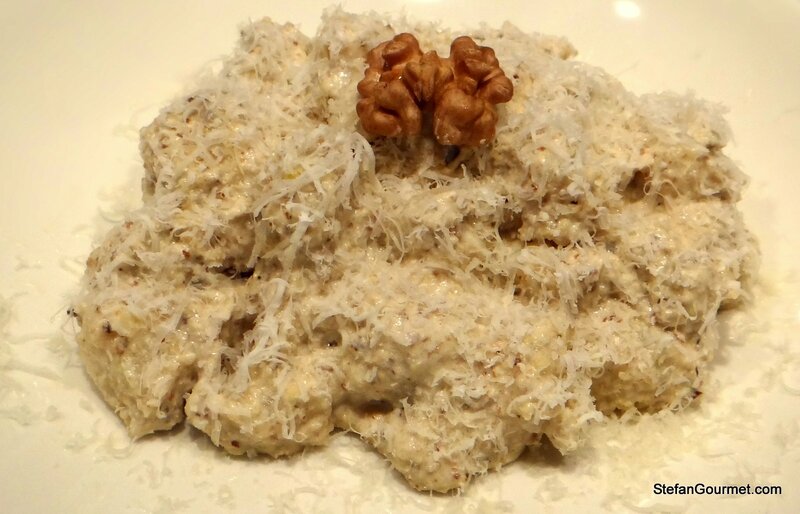 A sauce that works very well with either pasta or potato gnocchi is walnut sauce from Liguria. Patate e carote sono un classico dell’inverno. Guarda come ce le hai proposte! Fantastico piatto, anche il tonno mi spaventa un po’. This is my type of dish! Beautiful flavors and so nutritious! Wonderful! Simple, oh so simple but wonderful! Use cumin almost every day and have naturally used it with carrots, but this is one step further again . . .shall be copied as soon as the next piece of tuna in the house . . . I love cumin and carrots and potatoes, so why not? Brilliant! Love this, Stefan. I don’t normally prepare tuna because I haven’t many recipes for its preparation and get bored with those that I have. This one will be added to my recipe file, to be sure, I also added Niki Segnit’s Flavor Thesaurus to my virtual library where I can easily access it when at the grocery, farmers market, or fishmonger. Thanks for the heads-up.